Guide to reaching Ischia from Naples Capodichino airport or Stazione Central train station including advice about buses, taxis and trams. To reach Ischia from Naples Capodichino airport you must head towards one of the maritime ports of Beverello or Porta di Massa from where you will cross by sea to Ischia via hydrofoil or ferry. From the airport you have two main options of getting to the maritime ports. The first option is to take an "Alibus", an airport bus service that runs between the airport, the main train station (Stazione Centrale) and Beverello Port. The Alibus runs every 20- 25 minutes and the journey time is around 20 minutes, meaning a maximum transfer time of 45 minutes and a minimum of 20 minutes. Tickets for the Alibus are €4 per person if purchased on the bus from the driver, or €3 per person if purchased from a designated vendor at the airport. ﻿The second main option for the transfer from airport to port is by taxi. Taxis are more expensive but have the advantage of not having to wait for the bus. The journey time from the airport to Beverello Port or to Porto di Massa is around 20 minutes and should cost €19 plus €2 per suitcase. Below is the official website for taxis in Naples including a price list for journeys between the major destinations. The site is in English and Italian but at present certain destinations are not visible on the English version, including the journey from the airport to Beverello Port which is €19 (plus €2 per suitcase) and only shown on the Italian version. From the main train station in Naples (Stazione Centrale) there are a number of ways to get to either Porta di Massa or Beverello Port. 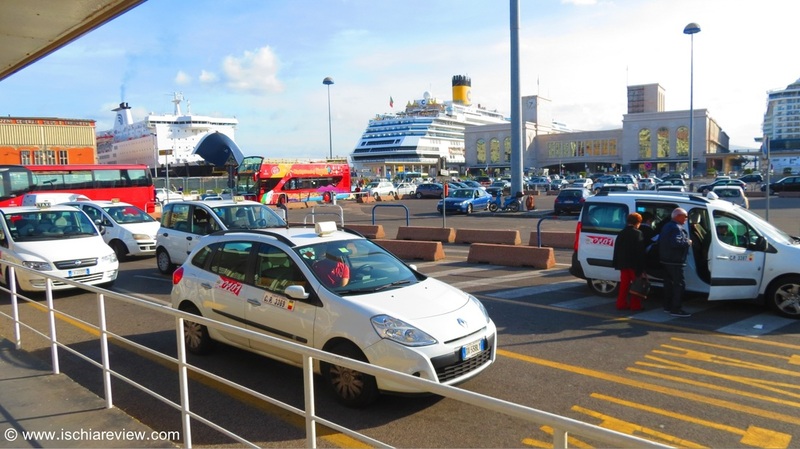 By taxi the journey to Beverello Port or Porta di Massa should take no longer than 15 minutes and costs around €15 plus €2 per suitcase. The second option is to take the Alibus which stops outside the station. The journey time to Beverello Port is around 10 minutes and costs €4 per person if tickets are purchased on board from the driver. There is a third option from train station to port and that is to use the tram. There is a number 1 tram that runs from Piazza Garibaldi, on the far side of the square from the entrance to the train station. The trams run every 10-15 minutes with a journey time also of around 10-15 minutes. Tickets cannot be purchased on board, instead they can be bought from a tabachi, newsagent or bar for €1.20 per journey. The trams run to both ports whereas the Alibus only runs to Naples Beverello. 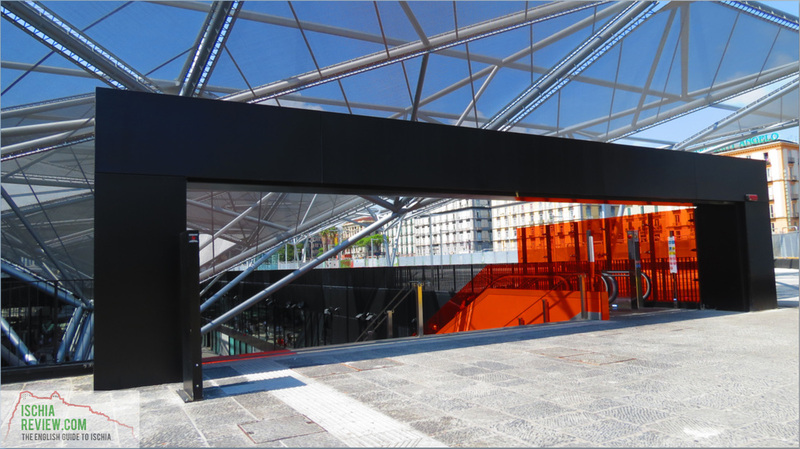 Since 2015 it has also been possible to travel by underground train/metro from Stazione Centrale to Beverello Port. ​Please see our guide below which gives full instructions on how to reach Naples Beverello using the Metro system. If your flight arrives to Rome, from both from Fiumicino Airport and Ciampino Airport you will need to get through Naples to arrive in Ischia. From Ciampino Airport you will need to arrive to the Train Station in Rome. You can either do it by bus, with the several companies that operate in between (ATRAL, Terravision, SitShuttle) or by taxi. From Fiumicino Airport you can take a train (the "Leornardo Express", that departs every 15 minutes and takes half an hour) to arrive to Rome Central Train Station, where the trains to Naples depart. Please note that most of the trains to Naples depart from Rome Central Station, but some of the high speed trains (Italo) depart from Tiburtina Train Station. At present, Ischia is served by crossings from two ports in Naples, Beverello and Porta di Massa. Beverello port is used for hydrofoil crossings and Porta di Massa is for ferries. Hydrofoils are generally faster than ferries with a journey time of around 1 hour as opposed to an hour and 40 minutes on the ferry. There is a difference in price to reflect the faster journey times with hydrofoils priced at €18.60 per person each way while the ferries are around €13 per person each way. The two ports are close to each other but not really what you would consider a reasonable walking distance. This being the case, there is a free shuttle bus service between the two ports which takes around 5 minutes with services every 15/20 minutes. Once you've chosen which port to disembark from you can complete the transfer to Ischia by sea. There are lots of crossings between Ischia and Naples throughout the day and for more information on this use the link below to the timetables page where you can choose your crossing and even purchase tickets on line if required.